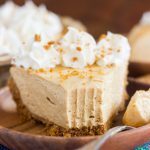 With a sweet, crunchy, cinnamony Biscoff cookie crumb crust and a creamy, fluffy, no-bake cookie butter cheesecake filling, these Biscoff Cheesecake Bars are ready in about 30 minutes! They’re strong on cookie butter! Good morning! Why does it have to be Monday again? This weekend flew by. 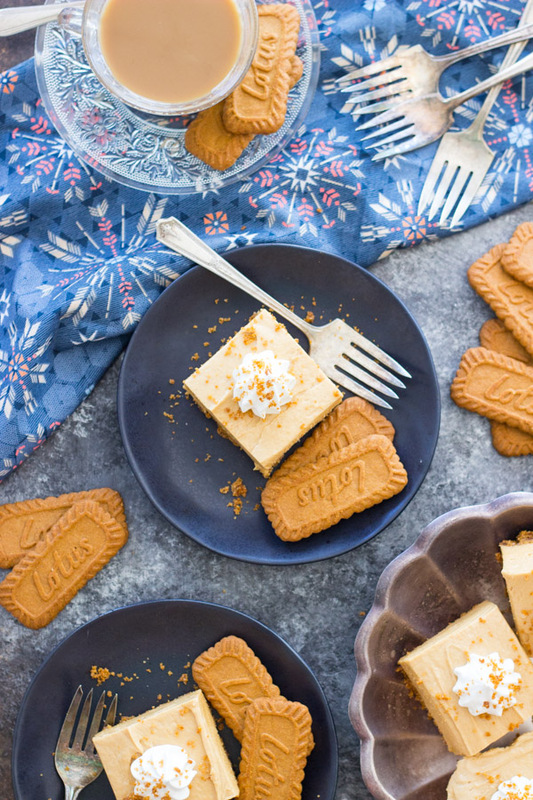 Thankfully, we can start off on the right foot with these Biscoff Cheesecake Bars. I spent the weekend in DC visiting my best friend from college and her 5 month-old baby boy. We had the most fun, but I am completely exhausted today. I was off for two days of work last week too, so I’m struggling to get back in the groove today. The trip had a lot of highlights – the cherry blossoms were in full bloom, so the Basin was a really beautiful walk, and she took me to see the Supreme Court. I absolutely loved it. It might be a little underwhelming if you aren’t very interested in constitutional law or our legal system, but since that’s my education, I LOVED it. It was amazing to see the courtroom and to think about all the landmark decisions that were made there. It was really interesting to me too that they only had 8 chairs in the courtroom. I wondered before going if they would remove a chair for the vacancy on the court, or if they’d still have 9 chairs arranged. I don’t know – I just thought that was interesting. Besides a few touristy things, we really stayed away from a lot of sights on this trip because the city was overwhelmed with people visiting. In three days, we went to two Nordstrom Racks, three Marshalls, and one TJ Maxx. It’s what we do. Leslie and I always bargain shop together, and I bought waaaay too many workout clothes, but I always know I’ll use them. The trip also involved a lot of desserts and donuts. That’s just what we do. She has the most adorable child, and he’s such a happy baby – until he’s not. But it’s few and far between that he’s not a really happy, even-keeled baby. That said, I’m not accustomed to being around kids, let alone a baby that truly requires attention every single second of the day, and I’m totally beat. I don’t know how she does it. I don’t know how any mom does it, for that matter. It’s such hard work. 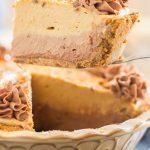 So back to real life today, and you’re probably wondering what you should do with a Biscoff Crust. Well, lots of things! 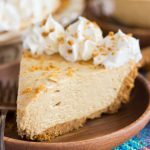 Really, you can use it for anything, but I mostly recommend using it for this Cookie Butter Cheesecake with Biscoff Crust (that’s probably a ‘duh’) or these Biscoff Cheesecake Bars. 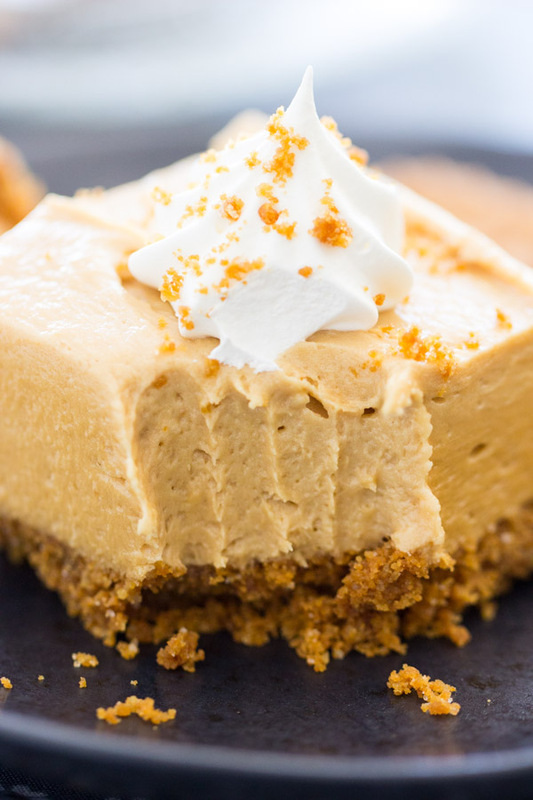 You guys really love that Cookie Butter Cheesecake with Biscoff Crust, and it’s really great because it…. tastes great… but it’s also great because it’s super simple, and almost no-bake. In the spring and summer, you want simple desserts. You don’t want to get too elaborate, or sometimes even turn on the oven. 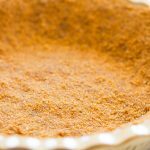 You don’t have to bake the Biscoff Crust, though I do find it’s helpful for cohesiveness. It’s a crumbly crust anyway, so I definitely recommend a few minutes in the oven to solidify it. 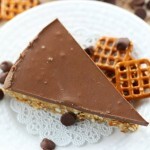 Hence, almost no-bake. These Biscoff Cheesecake Bars use that Biscoff Crust from the previous post, and the filling is similar to the pie that I posted. The filling is a little thicker and sturdier though. Why? Cheesecake bars just need to hold up more on their own – they don’t have a pie crust to help them keep their shape. They are boundless, so it helps to have a thicker filling. Know what I mean? 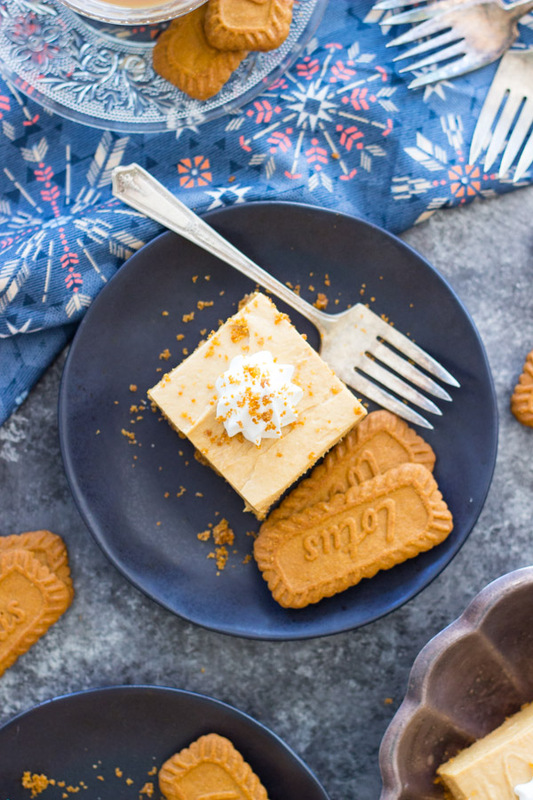 Nevertheless, these Biscoff Cheesecake Bars are ultra-creamy and silky, and loaded up with Biscoff cookie butter. No shortage of that key ingredient. 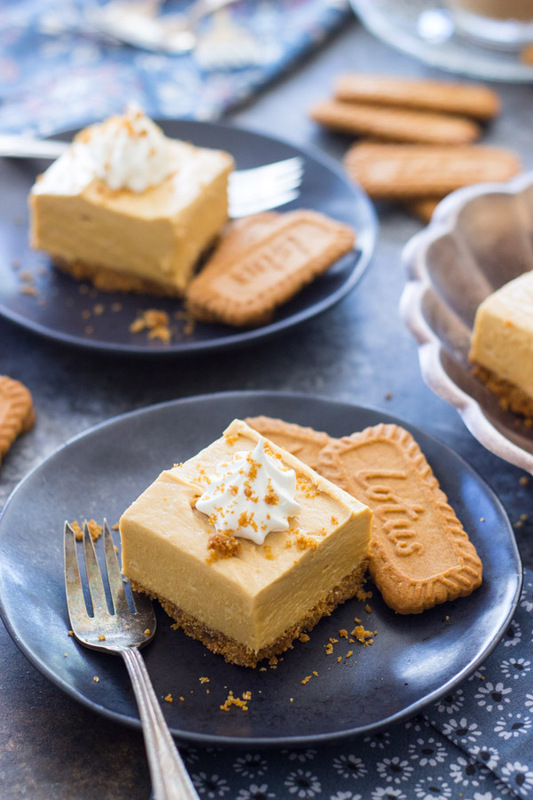 These Biscoff Cheesecake Bars are as easy as the cheesecake pie, and just as delicious. 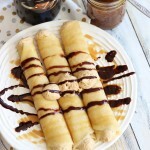 I love eating food in different formats, and these bars are a fun variation. 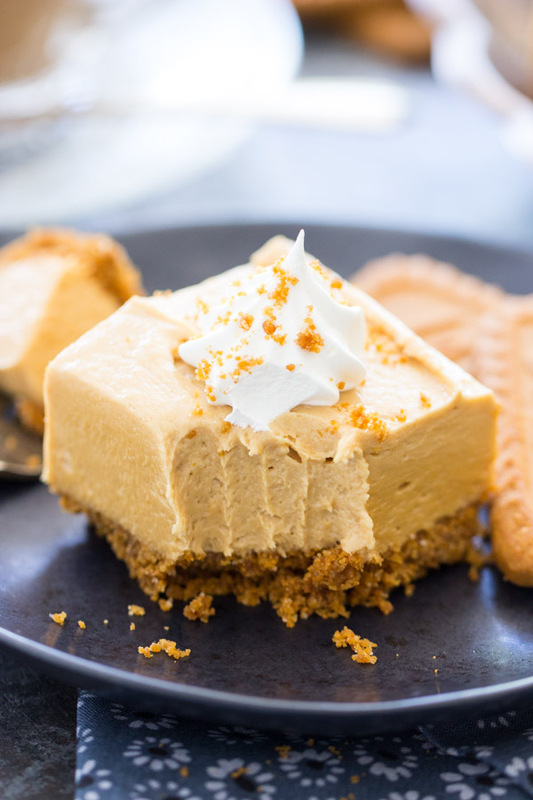 Also, you guys asked for more Biscoff cheesecake. Ask, and you shall receive!! 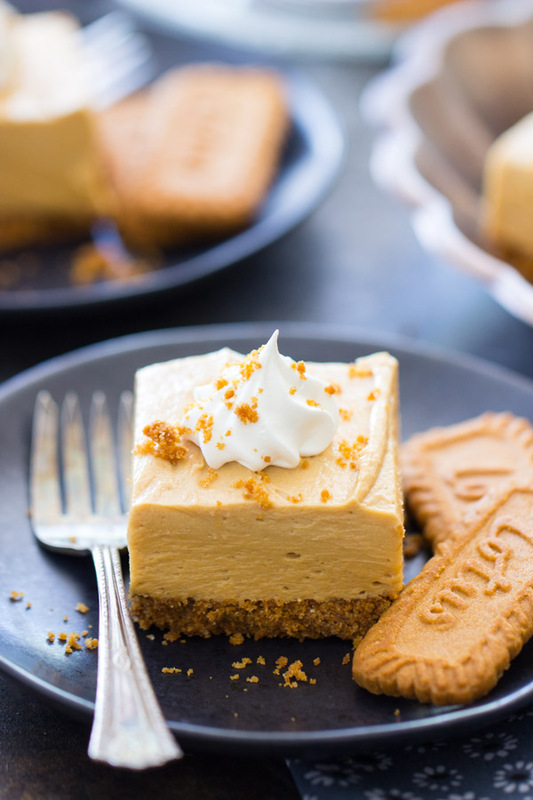 With a sweet, crunchy, cinnamony Biscoff cookie crumb crust and a creamy, fluffy, no-bake cookie butter cheesecake filling, these Biscoff Cheesecake Bars are ready in about 30 minutes! They're strong on cookie butter! In a large bowl, stir together cookie crumbs, sugar, and butter, until well-combined. Press into the bottom of a parchment paper or foil-lined 9-inch square pan (8-inch would work too). Bake at 350 degrees for about 10 minutes, or until crust is firm and set. What do you mean when you say cookie butter? If you google ‘cookie butter’, you’ll see examples. It’s a spread – it’s like peanut butter or nut butter, but it’s got crushed cinnamon cookies in it. Sounds weird, but it’s amazing. The two main brands are Biscoff Cookie Butter and Speculoos Cookie Butter (that one is found at Trader Joe’s). I find regular Biscoff Cookie Butter at Target, Walmart, Publix, etc. Have you tried it? This is absolutely delicious!!! I’ve been in love with Biscoff cookies ever since I had my first one on a Delta flight. Then I discovered the cookie butter. Mmmmm. When I saw this recipe, I knew I had to make it. I made it for company (a family of 8), and they LOVED it too! Thank you! Omg, I think I first learned of them on Delta flights too. Lol! Cookie butter is dangerous stuff, for sure. I love to bake with it! I’ve found it pretty versatile. I’m soooo glad you liked this recipe. Did you have any problems with it? Thank you for the kind comment!